Well, what a way to spend the first couple of days on my camping trip! 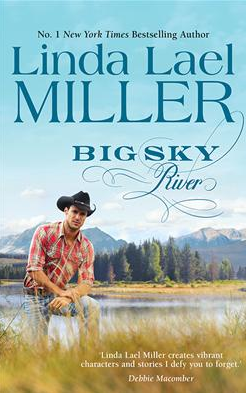 I have just finishing reading Big Sky River, by Linda Lael Miller (Harlequin), the follow-on book to Linda Lael Miller’s Big Sky Mountain which I reviewed a few months back and I have to say I quite enjoyed this light, romantic novel. In this most recent instalment, we follow the story of the town of Parable’s very own handsome Sheriff Boone Taylor, a man who is trying to get his life back together after the passing of his wife. His children are being raised by his sister while he is consumed with grief. We are also privy to the story of Boone’s neighbour, ex-city girl Tara Kendall who, after a painful divorce is reinventing herself and living her childhood dream – setting up a life in the country and starting a chicken farm. I was introduced to these characters in Big Sky Mountain, and to say that Tara and Boone don’t get along is quite the understatement. Even though Tara may need the help of her cowboy neighbour occasionally, she sees him as the country hick who lives across the river from her in the run down double-wide he calls a home. In turn, Boone sees Tara as a stuck up chick from the city who has no right to call herself a country girl. Big Sky River moves their story forward with new, major challenges. Due to a family tragedy, Boone’s two sons return to live with him and his life truly begins to change. So does Tara’s, when her twin step daughters unexpectantly come to spend Summer with her on the ranch. She’d given up hope that she would ever be permitted to spend time with the girls she loved more than life itself, and their reunion is an emotional one. And then, due to reasons neither Boone or Tara can explain, other than it’s written in the stars, Boone and Tara’s relationship starts to take a turn and gives them both hope – perhaps it is safe to believe in second chances?! I enjoyed the fact that in this novel we are not only able to get to know the characters of Boone and Tara better, but we are also updated on other previous favourites such as Hutch and Kendra, and Slade and Joslyn. Not to forget the ever-involved housekeeper, Opal who continues to play mother hen and matchmaker all over again. This was a light easy read and covered lots of the bases…romance, sexual tension, tragedy, angst, second chances, hope and lovely descriptions of country life in Parable Montana. Wonderful Summer reading!